IFPI is the “voice of the recording industry worldwide” representing the interests of 1,300 record companies from across the globe. Their major yearly report, The Global Music Report is available for download. The full report – with data and analysis costs £2,250. The Recording Industry Association of America (RIAA) is the trade organization that “supports and promotes the creative and financial vitality of the major music companies.” Lots of free reports. BPI, the British Phonographic Industry, represents the UK’s recorded music industry. The 2017 edition of the BPI Yearbook is priced at £90. Music Canada has three members, Sony, Universal and Warner Music. Last full update: May 10, 2013, some data updated September 2017. 1. With so many different communication industries covered on the FutureofPublishing.com, music occupies a position that sets it apart from the others; it’s where the battleground has been most clearly drawn. In the terminology of Nicholas Negroponte, it’s a deadly struggle between “bits” and “atoms” – the analog and the digital. Analog atoms are easier to control than digital bits. Analog also happens to feature higher retail prices and better margins. 2. Perhaps, in the end, information doesn’t want to be free. But once it’s digitized it’s unquestionably easier to set it free: to distribute multiple copies, often in contravention of copyright laws. Once the digital horse gets out of the barn…well, I think I’ll just stop that metaphor right there. But it will become clear as you read this article that the forces that have been unleashed by the digitization of music are proving all-but-impossible to reign in. 3. The changes in the music industry go far beyond the illegal distribution of digital copies of songs. Beneath these all-too-visible waves is a changing power structure: the relative power of artists, producers, distributors and consumers. 4. While the music industry is in the midst of an enormous transformation, music today remains exceptionally popular amongst consumers, particularly the demographic that matters most: younger people. There’s a great future for the music industry. It just won’t look very much like the music business of the 20th century. Music is a creative endeavor, and is “published” and then distributed in a manner similar to all other types of publishing examined on this site. Beyond the music itself, the lyrics are often poetic — indeed musicians such as Leonard Cohen and Joni Mitchell are among the many musicians who have published books of poetry and/or lyrics from their songs. Like books, the publication and distribution of music has always depended on available technology: 78s, LPs, singles, 8-track, CDs and pure digital. Technology and manufacturing has always shaped the direction of this industry, as it has all others in this survey. In the U.K., according to the Entertainment Retailers Association, game sales exceeded music sales for the first time in 2007, and were quickly catching up with DVD sales. 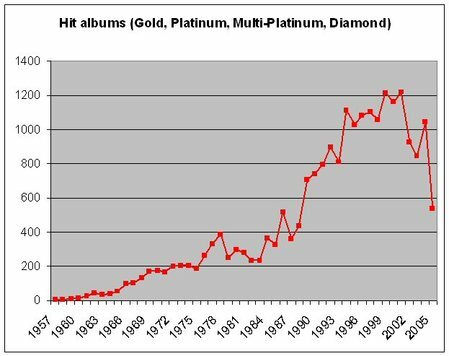 From a March press release: “Sales of music downloads increased 67.5% by value in 2007 to reach £145.6m (roughly $285 million U.S.), six times the value of the physical singles market. The digital rights management (DRM) battles that plague so much of the publishing industry started in the music industry because CDs had little or no built-in DRM protection, because software for burning CDs to digital formats was relatively easy to develop, and because Microsoft and RealNetworks got into battle early on, inspiring a host of smaller nimble competitors. Music files are relatively small compared to, for example, video files, and so could easily be distributed via even slow Internet connections. The traditional players in the music industry reacted with fury and managed to set the stage for battles to come in other publishing industries. The history of the battle for music rights on the Internet is brief and very much indicative of the kinds of struggles that have begun to impact other content providers. It started in 1999 with Napster, as copyrighted music began to be distributed around the net in a free-for-all. It couldn’t last and it didn’t: the courts mainly found in favor of the large traditional copyright holders of music and by the summer of 2001 Napster was gone. Sounds good until you read a few more of the details: TorrentSpy had already shut down in March, because of the ongoing litigation. Furthermore, the holding company, Valence Media, based on the little Caribbean island of Nevis, declared bankruptcy, as have its “principals”. 2. 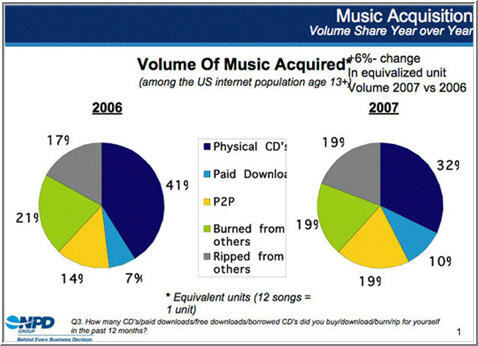 Devoting substantial coverage to the declining sales of CDs, in April 9, 2007, the Financial Times quoted extensively from Recorded Music and Music Publishing [2007-2009], published by Enders Analysis. 3. “Death of the Record Store.” In a January 18, 2007 article, The Economist pointed to an issue I had overlooked: the music retailing business is falling as fast as the rest of the traditional music industry. HMV, Virgin and other retailers are all pointing to declining financial results. Legal online resellers, like Amazon and CDNow (oops – they’re now owned by Amazon!) are siphoning off another chunk of the business. Retailers are pushing DVDs into the prime display racks: how much longer will this be a salve? 6. Dancing to a New Beat. 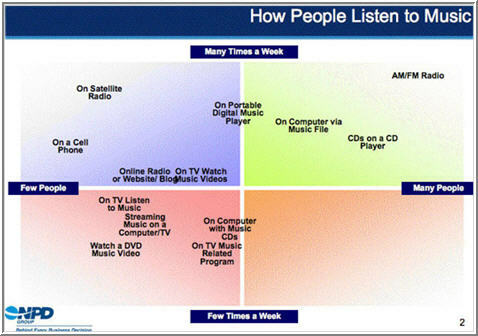 The ever-upbeat eMarketer is a prognosticator after my own soul. They don’t despair. We’re in the midst of some huge changes, but that’s not the end of the music industry. 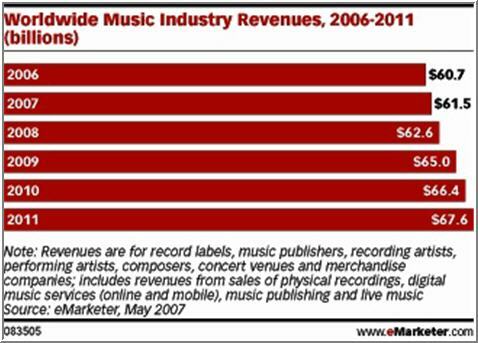 According to this report “With falling CD sales and single downloads failing to pick up the revenue slack, the music industry worldwide has been singing a sad song for the last few years, but that tune is about to change — along with almost everything else in the music business. 7. The big news at the beginning of 2007 was that EMI and Apple partnered on DRM-free premium music. For some reason I foolishly took that to mean that EMI would be giving the stuff away for free, when in fact that were increasing the price of each jingle by 30%. The difference is that the music will not include Apple’s DRM scheme (or any other), making it easy to transfer tunes between various digital music players. This is being touted as brilliant, brave forward thinking by EMI. I call it a long overdue move, but one it will not regret.